The SparkPost add-on has been deprecated. You may sign up for a free SparkPost account here. 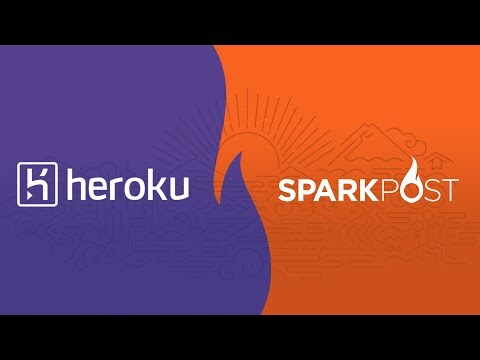 Existing Heroku apps with the SparkPost add-on will continue to function for the time being, including plan changes. However the SparkPost add-on can no longer be added to apps. SparkPost is an add-on for providing scalable email delivery and analytics for web and mobile apps. SparkPost is available via a modern RESTful API and has supported client libraries for Node.js, Python, PHP, Java, Go, C# and Elixir as well as documented examples in all those languages plus Swift, Objective-C and VB. Once SparkPost has been added, a SPARKPOST_API_KEY setting will be available as an app configuration variable and will contain the access token to use when calling the SparkPost APIs. This can be confirmed using the heroku config:get command. After installing SparkPost the application should be configured to fully integrate with the add-on. SparkPost is setup with a sandbox domain which can be used to send up to 50 messages. To send more messages, create a sending domain via the SparkPost dashboard or the API. After provisioning the add-on it’s necessary to locally replicate the config vars so your development environment can operate against the service. Use the Heroku Local command-line tool to configure, run and manage process types specified in your app’s Procfile. Heroku Local reads configuration variables from a .env file. To view all of your app’s config vars, type heroku config. Use the following command for each value that you want to add to your .env file. SparkPost is available via API and has supported libraries for Node.js, Python, and PHP. The SparkPost API enables client applications to integrate with SparkPost and perform actions associated with account management, message generation, and reporting. More information can be found at developers.sparkpost.com/api. SparkPost has a Node client library for your favorite SparkPost APIs. The module source can be found on Github. The following code shows an example of including the SparkPost module and sending a transmission. SparkPost has an official Python module. The module source can be found on GitHub. SparkPost has an official PHP client library. The module source can be found on GitHub. The recommended way to install the SparkPost PHP client library is through composer. For more information on the features available within the SparkPost dashboard please check out our Support site at support.sparkpost.com. The SparkPost dashboard allows you to view metrics and create sending domains and templates. or by visiting the Heroku Dashboard and selecting the application in question. Select SparkPost from the Add-ons menu. Sending may be disabled for up to 24 hours if a user downgrades to a plan and has exceeded the hourly or daily limit for the new plan. The request is denied if a user tries to downgrade to a new plan whose monthly limit is less than their current monthly usage. SparkPost can be removed via the CLI. The account will be suspended and sending will be disabled for your API key. All SparkPost support and runtime issues should be submitted via one of the Heroku Support channels. Any non-support related issues or product feedback is welcome at hello@sparkpost.com.